After the huge non-contest between bat and ball at Lahore, a lot is expected off the wicket at Iqbal Stadium, Faisalabad. The pitch, for starters, has never been too result-friendly. Since test cricket’s inception in this city, a total of 23 matches have been played. The home team has won six and lost five out of the 11 matches that have produced an outcome. Recently against England, Pakistan almost forced England into submission in the final day of the second test match, until the English lower-middle order fought back to salvage a tense draw. It was during the same match that Inzamam-ul-Haq scored two brilliantly-crafted centuries despite niggles in his back. Over the last few days, one man has taken more spot-light then either Inzamam or Rahul Dravid; and that man unquestionably is Agha Zahid, PCB’s chief curator. While some media sections and experts have lambasted him for making such a lifeless pitch, others have laid the blame squarely on the Pakistani team management, who they feel gave specific directions to Zahid to shave off any grass available on the pitch. Inzamam, however, in his column with Pakistan’s Daily Jang has emphatically refuted the claims. 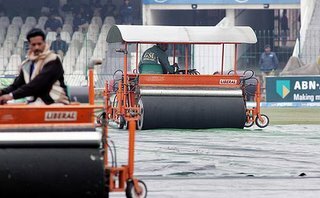 Zahid claims that weather had a part to play in improper preparation for the track in Lahore. One does feel that while that argument is acceptable, but to say that it was just the weather that led to such a batting haven is beyond acceptance. In England, the weather is dark and gloomy almost throughout the year. The curators there, however, are still able to produce tracks that are reasonably lively – tracks that have something in them for everyone. A testimony to this is the fact that most test matches there in the recent past have went into the final day. Nevertheless, moving on to Faisalabad, Inzamam has openly stated that he wants dead grass on the pitch and nothing else. Dead grass, he explains, results in little but consistent movement for the entire length of the test match. Also, a grassy wicket (even if it is dead grass) tends to stay firm for a longer period of time, resulting in consistent bounce and movement for the better part of a test match. However, the nature of soil in Pakistan could neutralize the effect of dead grass on the pitch; the movement would be only slight and fairly slow to pose any real problems for the batsmen. In the end, though, a lot will depend on the whether, which has remained bright and sunny for the last two days. Further sun-shine will bake, and thus harden, the surface resulting in greater bounce and pace from the pitch. Pitches and curators have never been under such pressure before. With India’s mammoth media contingency essentially breathing down the throat of the beleaguered Agha Zahid, the pitch-maker would spend a few sleepless nights until the test match draws to a close.